Published in 1919 this was the second edition of this Brisbane business directory, which covers Brisbane and the suburbs of Brisbane South, Woolloongabba, Annerley, Coorparoo, Bowden Hills, Bulimba, Newstead, Windsor, Albion, Sherwood, Corinda, Oxley, Sandgate, Brighton, Deagon, Valley, Red Hill and Paddington. This book contains a comprehensive index of the businesses in Brisbane and its suburbs. The first section is arranged alphabetically by surname, showing the suburb, map number and map co-ordinates. The second section is sorted by business type and includes peoples’ names together with the suburb. There is a key map as well as 16 section street maps. The directory also contains a list of wharves, ferries, rowing clubs, swimming baths, and other places of interest as well as buildings and government offices. 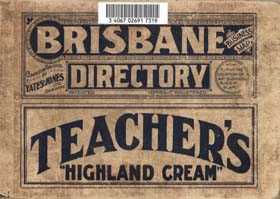 This publication will be useful for researchers of Brisbane's history and development. The maps in this product are not searchable.